Here’s a crazy fact: About 15 million people suffer from food allergies in the U.S. And many of these common food allergies cause icky issues like cramps, fatigue and migraines. We’re all about all good things in moderation up in here, but when it comes to true food allergies, unfortunately you just gotta do what makes you feel good. And the good news is that usually just a few shifts to your eats can make you feel waaay better if you’ve been feeling not so great. 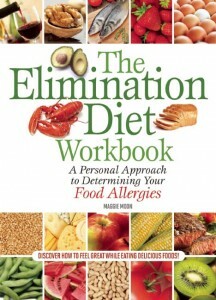 We were recently sent the book The Elimination Diet Workbook, a hands-on guide that can help you to pinpoint your exact food sensitivities no matter what they are — gluten, dairy, egg, soy, nuts, seafood or anything else. While an elimination diet can be kind of scary to do (Um, I have to take WHAT out of my eats?! ), it can be a really easy and, let’s face it, cheap (no doctor bills!) way to see if food is causing your health issues. To read up more on common food allergies — what they are, what they can cause and how you can overcome them — we thought we’d share the below excerpt from The Elimination Diet Workbook. 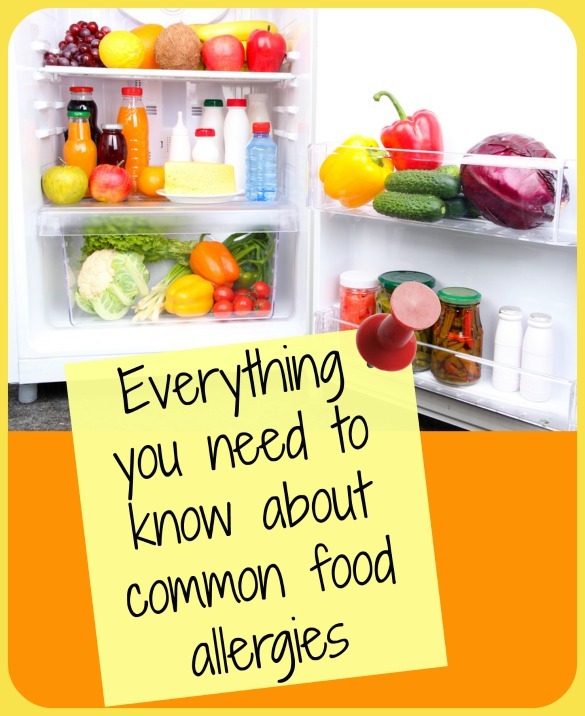 It’s like a crash course on everything you need to know about common food allergies! The study of food allergies and intolerances is an active and ongoing area of research, and it grows with each passing year. This means that the understanding of food sensitivities continues to grow, but it also indicates that there are many questions still unanswered or without clear answers. This excerpt provides a basic overview of how food sensitivities work and points out what is still unknown. What are the most common food allergies? In children, the most common food allergies are to cow’s milk, chicken eggs, peanuts, tree nuts, soy and wheat. Interestingly, children often outgrow allergies to milk, eggs, wheat and soy in early childhood. In adults, the most common food allergies are to peanuts, tree nuts, fish, crustaceans (e.g., shrimp, crab, or lobster), mollusks (e.g., clams, oysters, or mussels), fruits and vegetables. Are food allergies different from food intolerances? Yes, they are. However, they can both be described as food sensitivities or adverse food reactions. Sometimes they even cause similar symptoms, such as nausea, vomiting, diarrhea or stomach pain. Some symptoms are more typical of an allergy, and some are more typical of a food intolerance. Most health professionals agree that the defining difference is that a food allergy is the result of an abnormal immune system reaction to food, whereas an intolerance is caused by something other than an immune response. What is a food allergy? A food allergy is the result of a confused immune system. Normally, we appreciate how the immune system goes to battle for us, deploying an array of defensive compounds to fight inflammation, infection, disease and injury. It does this by recognizing and attacking substances that are foreign and harmful. When the immune system mistakenly targets a safe food, the reaction is called a food allergy. Can I have an allergy to something that is not a protein? You may have heard that true allergies can be caused only by proteins. As far as we know today, this is true. That’s probably because the immune system is able to detect specific proteins and interact with them. In the case of a specific allergic reaction, the immune system overreacts to specific proteins. There are a couple of important things to keep in mind. First, proteins are abundant in many foods, from kale to chicken, not just meat or beans. In fact, there are proteins in just about all food. Second, some substances that are not proteins (e.g., nickel) are allergens. How can this be? Well, nickel in particular comes into contact with skin and binds with a protein in the skin to create a nickel-protein complex; that combination is what sets off the allergic reaction. So in the end it is still a protein that is involved in the allergic reaction. To add one more layer to this story, it is thought that proteins must have certain characteristics to be potential allergens. Because most of us eat hundreds of millions of protein molecules a day, this is actually very good news. Only some of them have the potential to be allergens, and only some people are sensitive to them. Potential allergens are water soluble, meaning they can travel in steam and hang out in liquids. They have to be strong enough to withstand heat and acid, which means you can’t cook or marinate your way around an allergen (and neither can the temperature of the stomach acids in your digestive tract). They also must have a certain size and shape of molecule to interact with the antibodies that trigger the immune response. What is a food intolerance? When eating a certain food leads to negative symptoms and the immune system is out of the picture, that is a food intolerance. Many food intolerances are the result of something going wrong during the digestion process or even after absorption, and many of the symptoms are gut-related (e.g., nausea, vomiting and diarrhea). The immune system is not to blame in this case. Often symptoms are the result of you eating more than your personal threshold for an “offending” or “trigger” food, whether it’s just a little or a lot of a specific food. Can symptoms of food intolerance actually be signs of other conditions? Yes, other conditions that affect the digestive system can have symptoms similar to those of a food intolerance. For example, inflammatory bowel disease (IBD, which includes Crohn’s disease and ulcerative colitis) and irritable bowel syndrome (IBS) can both have symptoms similar to those of a food intolerance to lactose. Celiac disease may also cause symptoms similar to those of a food intolerance. Could I feel symptoms after eating a food without it being either an intolerance or an allergy? Yes, of course. For example, if you ate 10 pizzas in 23 minutes, there’s a pretty good chance you’d be feeling some side effects. That’s not the kind of food intolerance we’re talking about. Also, if you eat a bad oyster or tainted lettuce and end up with nausea, stomach cramps and vomiting, that is food poisoning. These negative outcomes can happen to just about anyone. The hallmark of a food allergy or intolerance is that it affects only people who are specifically sensitive to a given food. Their reaction to their personal trigger food is different from what the majority of people would experience after eating the same food. How do food intolerances work? Let me count the ways! First, we don’t understand everything about the process of intolerances. The good news is that we can use what we do know to help people feel better. It’s one of the reasons nutrition is such an exciting field; we have a lot of exploring and discovering to do. But because we don’t understand food intolerances perfectly, and because there are so many ways in which the body can react poorly to a food, food intolerances can be difficult to treat. This is a prime reason for using the elimination diet. Still, we do know a few things. We know that food intolerances are dose dependent. This means that the higher the “dose” of a food you eat, the worse your symptoms will be. We know that some intolerances occur because the body is missing an enzyme or doesn’t have enough of an enzyme it needs to digest something. A good example of this is lactose intolerance; the body does not have enough of the enzyme lactase to digest the milk sugar called lactose (e.g., in milk, yogurt and ice cream), resulting in gastrointestinal distress. Some intolerances are a reaction to drug-like chemicals in certain foods and food additives, such as histamines (e.g., in alcohol, vinegars and some artificial colors). Last, some intolerances are common enough that we can identify them when we see them; however, we don’t have full knowledge of how they work. Examples of intolerances of food components include reactions to certain additives, such as sulfites, benzoates or monosodium glutamate (MSG). Sulfites can be found in wine and some dried fruits; benzoates are in some preservatives and cinnamon; and MSG is sometimes added to foods or can be found naturally in some foods, such as tomatoes and mushrooms. What about food tolerance? How does it work? It’s easy to take “food tolerance” for granted because it is the body’s normal state, and it is unremarkable because food tolerance doesn’t have the uncomfortable side effects of food intolerance. Current scientific opinion suggests that under normal conditions, the body learns to tolerate foods in infancy, even though foods are foreign substances. The body tests each food as it is introduced to the young immune system. In the normal scenario, new foods are tested by the immune system and recognized as safe, after which “memory cells” take up residence in the digestive tract so that it will remember that a food is safe the next time it shows up. What is an offending food? What is a trigger food? These are ways of describing a food that causes negative symptoms. Although a food may be safe and even beneficial for most people, for those with food sensitivities — be they allergies or intolerances — these foods cause negative symptoms and are called trigger foods, aka offending foods. For example, a strawberry is a sweet reminder of the early days of summer for most. But if it’s a trigger food for you, it probably looks more like poison. In the case of allergies, the trigger food is also called an allergen. Why is it that my sister can enjoy ice cream, but I can’t go near it without getting a stomachache? When it comes to food sensitivities, we don’t know exactly why reactions to a certain food will differ from one person to the next, even among people in the same family. What we do know is that any food can trigger a reaction in the immune system of someone who is specifically susceptible to it, whether the person is allergic to the food or his or her body is unable to digest or absorb the food normally. Genetics may play a role in how likely you are to develop an allergy, but it’s not specific. In other words, if your mother or father is allergic to peanuts, you may inherit the tendency to be allergic but not necessarily to peanuts. You might find yourself allergic to, say, bananas. How you first met a food can also have an effect. Did you meet it too early in life? Too late? The microbiota in the gut may also be involved, but this is an early and emerging area of science. However, it seems that the microorganisms that colonize the digestive tract can have a huge impact on how you process food. Lastly, any medications you’re taking can play a role, perhaps partly because it can change your microbiota. What are some of the symptoms of a food allergy? Food allergies can announce themselves in many ways. Some examples of more common symptoms are hives, eczema, stomach pain, diarrhea, nausea, vomiting, asthma, congestion, runny nose and earache. In severe cases, the entire body reacts against a food; this is called anaphylaxis and it can be deadly. What happens during an allergic reaction to food? The allergic reaction starts with an allergen, a food protein that triggers an allergic reaction in someone who is specifically sensitive to it. The allergen enters the body, and the immune system goes to work: Its white blood cells (leukocytes) go into defensive mode and release chemicals that under normal circumstances are meant to protect the body, but they also cause the negative symptoms of an allergy. Imagine your immune system is a 911 emergency call center. In an allergic reaction, the allergen is like the phone call to the call center that sets everything else in motion. The operator in charge of your case is like the type of white blood cells called the T-helper cells. They are in charge and will manage the rest of what’s about to happen, including dispatching emergency responders, such as police or an ambulance. In the immune response, the emergency responders, called cytokines, are the messenger chemicals. Continuing with the metaphor, let’s say the 911 operator responds to two kinds of calls on a typical workday. One is the common my-cat-is-up-a-tree or my-neighbor’s-music-is-too-loud kind of call. The other type of call, thankfully, isn’t as common: maybe someone’s house is on fire or someone has fallen down the stairs. The first kind of call is like what happens in a T-helper cell reaction type 1. The second kind of call, T-helper cell reaction type 2, is like the immune reaction that happens only in people who are specifically sensitive to a given allergen. In reaction type 2, the T-helper cells include a special set of cytokines (emergency responders) in the immune response and a specific type of antibody is created called an IgE antibody. This type of antibody triggers a series of reactions that can result in symptoms typical of allergies, such as hives, hay fever, itching, swelling, reddening, and asthma.